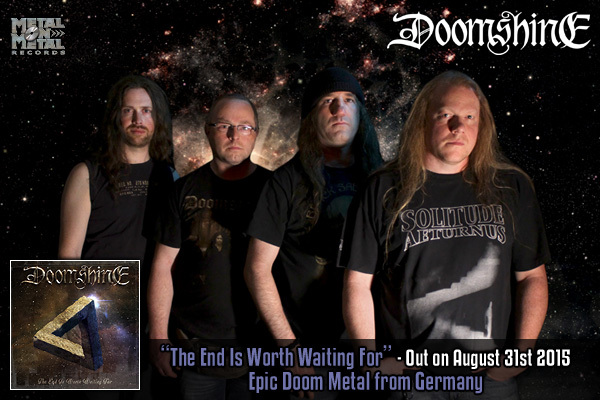 "THE END IS WORTH WAITING FOR"
The German epic doom metal masters have taken their time to create a new opus... 5 years after their sophomore album, DOOMSHINE finally deliver their 3rd full-length. Was it worth waiting for? We have no doubt all those who loved this band so far will be as enthusiastic about their new songs. They weave the spell of doom, dwelling mostly in slow and mid tempos, even though in one song venturing also into faster passages. Beautiful and haunting melodies, musical, clean and smooth vocals with the most pleasant timbre, heavy as lead riffs, excellent musicianship, and a good variety of moods and tempos is what they offer on this exceptionally inspired album. This band keeps shining on like pure gold in the doom metal pantheon. A must have for all SOLITUDE AETURNUS, THUNDERSTORM, CANDLEMASS, SORCERER, PROCESSION, ISOLE and FORSAKEN fans! The members of epic doom metal band DOOMSHINE from Southern Germany have known each other since at least 1990, but it wasn't until 2000 that they started making music together. Initially under SLEEP WITH THE DEVIL moniker, Markus Schlaps (drums), Sven Podgurski (guitar, at that time playing in SPIRAL TOWER, and previously in VARIETY OF ARTS and TRAGEDY DIVINE) and brothers Timmy and Sascha Holz (guitar and vocals respectively), joined soon by Carsten Fisch (bass), started writing songs and played their first gig in Marbach, in October 2000. Soon after that Sascha left the band and Timmy took over the vocal duties. In 2001, the band decided to change their name to DOOMSHINE. The first gig under a new name followed on March 28th 2002 (at Club II Rockfabrik in their hometown Ludwigsburg). In the summer of the same year the band entered the studio to record "Shine on Sad Angel" and "Where Nothing Hurts but Solitude". The first song was chosen by the editors of "Heavy oder was?!" (later "Heavy") magazine to be featured on "Metal Crusade V" compilation coming with the December issue. Still without having any release of their own, on February 7th 2003, DOOMSHINE opened the first edition of the (meanwhile legendary) Doom Shall Rise festival, where they shared the stage with FORSAKEN, REVEREND BIZARRE, REVELATION, THUNDERSTORM, OFFICIUM TRISTE, SEMLAH, DAWN OF WINTER, MIRROR OF DECEPTION, WELL OF SOULS, DREAMING, VOODOOSHOCK, and others. Two more shows followed that year. In June 2003, DOOMSHINE signed a contract with Iron Glory Records for the release of their debut album. Before it was ready though, in August of the same year, Metal Supremacy released a 7'' vinyl single entitled "Shining in Solitude", featuring the first 2 songs recorded by the band: "Shine On Sad Angel“ and "Where Nothing Hurts but Solitude". 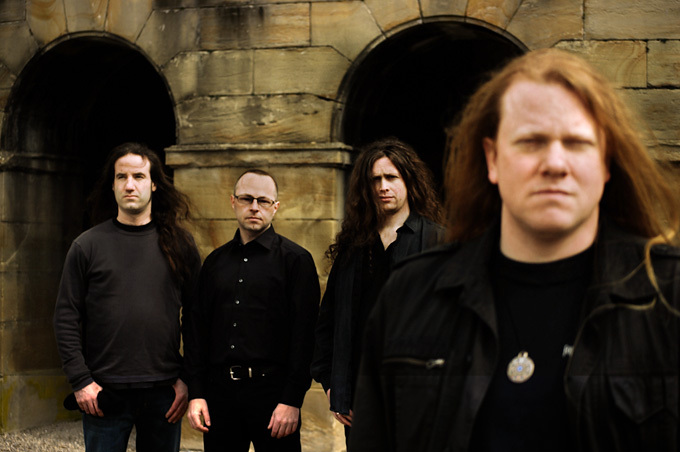 Their highly acclaimed debut album "Thy Kingdoom Come" was released on CD on June 28th 2004 through Iron Glory. LP version was released later that year by Immortal Vinyl Records and featured an exclusive bonus track, "Trouble Fire". The album reached 5th place on the "Rock Hard" magazine charts. DOOMSHINE was then voted on rank 11 of the best newcomers in 2004 by the "Rock Hard" readers. 2004 marked also increased live activity of the band. They played 8 gigs, including one with SACRED STEEL and TANKARD, as well as their first show abroad at Dutch Doom Day III festival in Rotterdam, on September 19th, together with REVEREND BIZARRE, BEYOND BELIEF, WELL OF SOULS, among others, as well as a local fest in Stuttgart, Banging the X-mas-Tree. As Iron Glory went out of business, in February 2005, DOOMSHINE signed a record deal with Massacre Records, who distributed the debut and recognized the big potential and great sales results the band got. The band expected to have their second album out in 2006, however in the end it took much longer than originally planned. On April 23rd 2005, DOOMSHINE participated in another important doom metal event abroad: Belgian Doom Night III in Gent. This time they played with COUNT RAVEN, PLACE OF SKULLS, THE GATES OF SLUMBER, OFFICIUM TRISTE, PALE DIVINE, MIRROR OF DECEPTION, ESOTERIC, RISING DUST and ATARAXIE. The next festival appearance of the band was at the Metal Bash festival on July 30th of the same year, and then at Ragers Elite Festival on November 26th. Meanwhile, in October 2005, they also played at the 15th anniversary party of their friends from MIRROR OF DECEPTION. DOOMSHINE wrote most of their songs for the sophomore album in 2005, however then they slowed down quite a lot for personal reasons (work and family). It was recorded during several sessions in 2006 (drums, guitars, bass) and 2007 (lead and backing vocals) at the band's bassist, Carsten Fisch studio. During the very rare spare time in 2007, 2008 and 2009, Carsten worked on the mixing, and then on the cover art and CD layout. For the same reasons the band didn't play live much during the next years. On July 16th 2006, DOOMSHINE had a gig at the Metallic Noise festival. On July 21st 2007, they performed at the 3rd edition of Hell's Pleasure Metalfest, with bands like ANCIENT RITES, DESASTER, MORTUARY DRAPE, ZEMIAL, NECROS CHRISTOS, EARTH FLIGHT, RAVEN BLACK NIGHT. And on November 24th of the same year, DOOMSHINE played at a small fest in Dortmund, Days of Doom, together with MIRROR OF DECEPTION, ISOLE and TORTURED SPIRIT. In 2008, the band traveled to Switzerland to play at Dawn of Doom II Festival. The billing of this 2-day fest (November 14th-15th) included LORD VICAR, MIRROR OF DECEPTION, WALL OF SLEEP, PHASED, GRIEF, STEREOCHRIST, DREAMING, RISING DUST, OPHIS, BLACK SHAPE OF NEXUS and a few other acts. In 2009 they played just 2 gigs: in February at Monastic Doom XVIII (with GORILLA MONSOON) and in May at Doom in Bloom (with MIRROR OF DECEPTION and four other bands). On April 10th 2010, DOOMSHINE returned to the holy doom metal chapel in Göppingen... They played on the second day of the revered Doom Shall Rise festival, and shared the stage with NOMAD SON, ISOLE, MOURNING BELOVETH, SEAMOUNT, THE 11TH HOUR, MAGMA RISE, UNSILENCE, 40 WATT SUN, RITUALS OF THE OAK, JEX THOTH and others... During the song "Where Nothing Hurts but Solitude", doom metal veteran and the band's friend, Leo Stivala of FORSAKEN made a guest vocal appearance. The band played one more show in September 2010, together with EARTH FLIGHT. Almost exactly to the day, 6 years after their debut album, on July 2nd 2010, the second album "The Piper at the Gates of Doom" was finally released through Massacre Records. While its title is a clear reference to the PINK FLOYD debut from 1967, musically it's pure epic doom metal in the vein of SOLITUDE AETURNUS and CANDLEMASS again, while the lyrics are quite critical and cynical, and focus on the darker shades of mankind. The album was mastered at the Red Room studio by Andy Horn (HALFORD, ROB ROCK, MAJESTY, EXCITER, MANTICORA, EDENBRIDGE, LIV KRISTINE...). Apart from 9 original songs, the album features a cover version of MIRROR OF DECEPTION song “Vanished”, showing the loyalty within the doom metal scene. "The Piper..." garnered many rave reviews and landed on the 2nd position of the monthly "Rock Hard" magazine charts. Later on, in 2011, Immortal Vinyl Records released it on wax as a 2LP gatefold edition. On April 15th 2011, DOOMSHINE performed at Metal Inferno Festival, and later that year played 3 more gigs, together with SLOUGH FEG, REAPER and other bands. On March 10th 2012, they had a show at the first edition of the German Swordbrothers festival, together with ROXXCALIBUR, ALPHA TIGER, ETERNAL REIGN and IRON KOBRA. They also played a gig with BLACK ABYSS in April. In 2012, the songwriting for the yet untitled 3rd studio album commenced and continued all through 2013. The basics and the skeletal structures of six songs were finished by the end of the year. 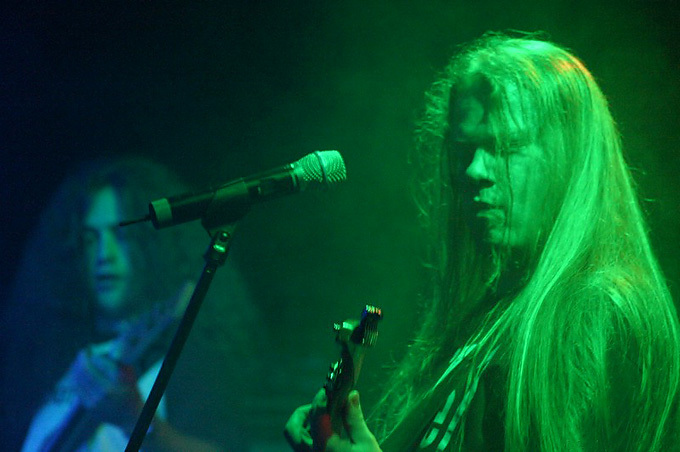 DOOMSHINE played only one live show in 2013, however quite a prestigious one. The band was invited to Malta for the VI edition of Malta Doom Metal VI festival, which took place on October 25th-26th. They shared the stage with DARK QUARTERER, NOMAD SON, THE PROPHECY, IRON HEARSE, MAGMA RISE, THE DROWNING, FAAL, VICTIMS OF CREATION and a few other bands. And like in 2010 at DSR VII, they had a special guest on stage: Leo Stivala from the Maltese epic doom masters FORSAKEN again grabbed the mic to sing "Where Nothing Hurts...". It was a triumphant show and definitely one of the highlights of this festival. It was also there where the band met again the two traveling metalheads from Metal On Metal Records. It didn't take long for DOOMSHINE and Metal On Metal Records to reach the agreement for releasing the next opus of the band. The contract was signed in January 2014, at the time when the band was composing the 7th and last song for their next album, scheduled for an early 2015 release. The recording commenced in the spring and ended one year later. According to the band, "The variety is huge, that's for sure. From slow devastating Doom to faster Heavy Metal..." while "Lyrically it will be the opposite part to the "Piper" album. More light, more optimism and a lot of positive thinking. But don't worry, the lyrics won't be happy or funny, it's just that positive vibe you hopefully will feel." "The End Is Worth Waiting For" was released on August 31st. On their 3rd full-length DOOMSHINE dwell mostly in slow and mid tempos, weaving their spell of doom throughout 7 inspired, epic songs. This band keeps shining on like gold in the doom metal pantheon.